We’ve updated and reposted this Thanksgiving Day treat, from Lily Bui! Dig into this serving of Thanksgiving projects with your friends and family! Help researchers take census of winter Monarch butterflies. Count Monarchs in colonies, during the mornings around Thanksgiving. Get started! Help monitor winter bird populations in Western states. Count birds within a 15-foot area, anywhere in the Western states, for one hour on Thanksgiving Day. Get started! Ready for dessert? How about some Pi? Test your own number sense, or download this software and adapt it for your own research or educational purposes. Get started! Walk off that big meal while improving the health of your local beach. This app will allow you to check in when you find trash on our coastlines and waterways. Get started! What is the Friday After Thanksgiving Chain Reaction? A grand event that could only happen at MIT! 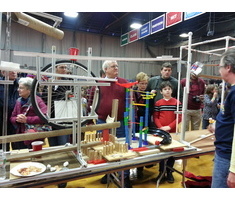 Participants link their chain reaction devices together forming one mega chain reaction – set off at the end as the event’s thrilling culmination. More than 1,500 people attend this fun-for-all-ages “extreme” event! Get started! Happy Thanksgiving from the SciStarter team!